In 1987, John McTiernan's Predator was released, and Arnold Schwarzenegger taught us that "If it bleeds, we can kill it!" Although there have been numerous sequels, comics, novels, games, and a reboot movie on the way, nothing compares to the original. 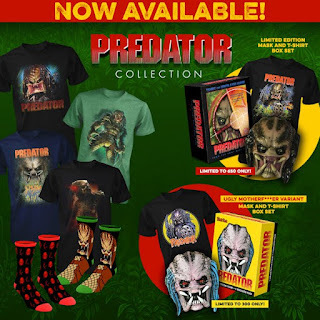 Fright-Rags has released the Predator Collection in honor of its 30th anniversary. The Predator Collection marks the return of Fright-Rags' popular mask and shirt box sets. There are two versions available, each of which features an exclusive tee designed by Justin Osbourn and a retro-style ventilated mask packaged in a collectible window box. The standard version, limited to 650, is based on the Predator's appearance in the movie. The Ugly Motherf***er variant, limited to 300, is inspired by 1980s horror trading cards. While Osbourn's shirts are exclusive to the box sets, the artwork can be purchased separately on zip-up hoodies, and the Ugly Motherf***er design is available on baseball tees. The Predator Collection also includes four shirts from artists Jason Edmiston, Paul Shipper, Chris Lovell, and Coki Greenway, plus two different styles of custom-knit socks. The hunt is on now at Fright-Rags.com. The Predator Collection shirts are in stock, while socks will ship in approximately 10 days and mask box sets are due out in mid-June. Quantities are limited. In addition to The Thing collection available earlier this month and the Predator collection on sale now, Fright-Rags has Chucky and The Texas Chainsaw Massacre apparel dropping next week.